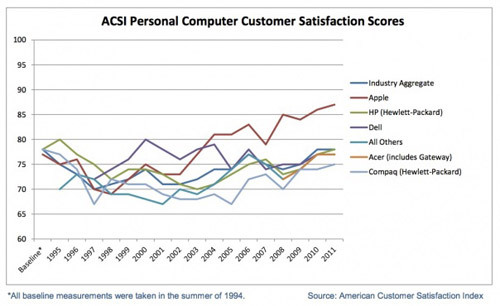 According to the very latest new ACSI (American Consumer Satisfaction Index) study for computers, Apple has stretched its lead in real-world satisfaction to a record 87 points. The Mac creator comfortably tops the charts ahead of Windows PC builders, which sit ten points behind on average. Although HP, along with its entry-level Compaq branch has moved up a point, the gains could be rendered void in the next year due to the company discussing exiting the PC game completely – a move which can be attributed somewhat to Apple’s iPad hijacking much of its market base. Apple has gone from strength to strength since 1998, and the Cupertino company’s continued dominance in the ACSI owes much to its era-defining innovations which have created new categories in the computing market. The iPad, for example, wasn’t the first tablet by any stretch of the imagination. However, the device did create the market from which other companies such as Samsung, Motorola, Dell, and, er, HP have since sought to capitalize on. In addition to the iPad laying the groundwork for the tablet market, the fruit company is also credited with forging the ultrabook category with it’s uber-thin MacBook Air. Apple’s continued motif of using higher-quality parts, allied to the fact that it has its own self-maintained stores, are two of the primary reasons why its perceived impact far surpasses that of its competitors. One suspects that if all Apple products were sold through third-party resellers, its impact would be nowhere near as great. Studies carried out by acclaimed market research firms have shown that Apple also dominates on the smartphone front when it comes to consumer satisfaction. The iPhone 4, which will be 16 months old when the iPhone 5 drops sometime next month, and the iPhone 3GS, which is over two years old, scored 838/850 on September’s chart, compiled by JDPower. That is 50 points ahead of the industry average, and 37 points in front of nearest-rival HTC – which has the advantage on paper of providing 4G smartphones. It’s important to note that Windows does dominate the market with 90% of computer users worldwide running variations of its operating system. OS X is created to function on a handful of different Macs, which gives Apple much more scope to make the experience as satisfactory as possible.